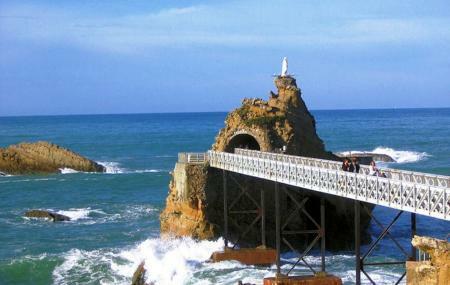 Locally known as the Rocher de la Vierge, it is considered a lucky landmark dedicated in the name of the holy Virgin Mary. It is because of the statue of the Virgin on the summit. In 1865 it was used by Napoleon III as his anchoring point for the Port of Refuge like that he wanted to create. The statue was a token of gratitude by whalers who were once miraculously saved from being ship wrecked and from behind this rock they saw a divine light. To access this rock a wooden bridge was constructed and its path was mainly used to carry stones needed to build the dam. The wooden bridge later broke down and in its place was built an iron bridge that still exists. It was built by the famous Gustave Eiffel, the man behind the Eiffel tower. You’ll have to drive to here, or hire a taxi. How popular is Virgin On The Rock? People normally club together Musee De La Mer De Biarritz and Port Des Pecheurs while planning their visit to Virgin On The Rock. People also prefer to start their day with Virgin On The Rock.